From the ancient world to the present, people have turned to powerful words, symbols and images as magical shields against bad luck, evil spirits, debilitating illness and sudden death. In medieval and early modern Europe, textual amulets on parchment and paper were often inserted in sacks or suspension capsules that could be worn around the neck and over the heart, or alternatively bound to an afflicted body part for focused healing. Others were posted on interior and exterior walls to ward off evil, just as apotropaic inscriptions were displayed on doors and lintels of buildings for blessing and protection. The Black Death gave impetus to hand-production of plague amulets offering divine protection and supernatural healing. In the 15th century, the technological innovations of block printing and typographical printing helped meet growing demand. Inexpensive and expendable, printed amulets were batch-produced on paper for sale and distribution by clergy or itinerant peddlers. ‘Pestblätter’, or plague sheets, spread across German-speaking lands over the next centuries, integrating popular religious imagery with Latin or vernacular text. The emphasis was usually on two plague saints: Sebastian (d. 290 AD), who according to legend interposed his body to defend ancient Rome from a hail of plague arrows; and Roch (1295–1327), portrayed as a pilgrim who had triumphed over disease, and often shown lifting his tunic to reveal a plague sore on one of his thighs. 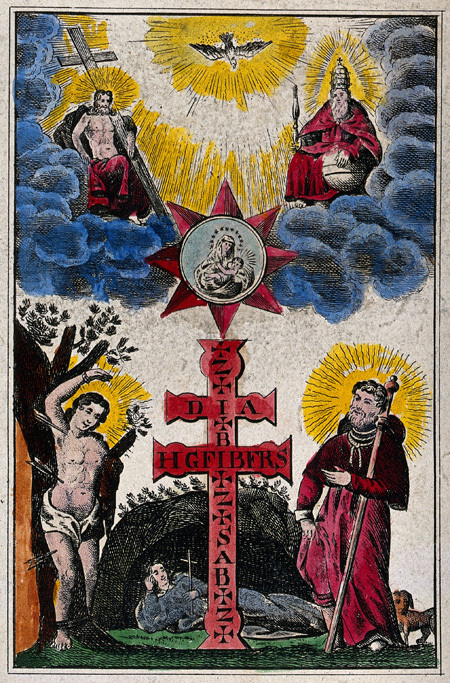 Printed amulet depicting a plague cross with Saint Sebastian, Saint Roch and Saint John of Nepomuk. Printed on a small piece of paper measuring 8.2 x 5.4 cm and hand-coloured in red and yellow ochre, green and mauve gouache. Iconographic no. 11165i. 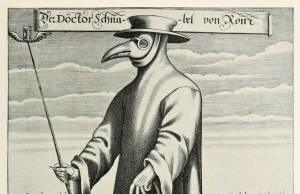 Wellcome Images V0033364. Amulet producers drew upon standard texts and images, but over time incorporated new elements, as we can see in the Wellcome Library’s holdings of plague amulets from the 16th century and later. 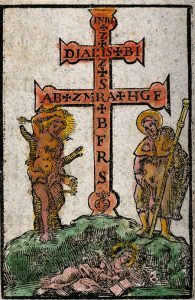 These combine traditional Christian iconography of sacred figures, such as Christ and the Virgin Mary, with saints associated with plague protection, variable sequences of crosses and majuscule letters (called ‘characteres’ in Latin or ‘Buchstabenreihe’ in German), and other textual and visual elements. Our focus here is the 17th-century woodcut amulet shown above. The amulet does not seem to have been folded up for insertion into a pouch worn on the body. More likely, it would have been posted on a door or wall to protect home and family. One’s eyes are drawn to a standing Patriarchal cross with two crossbars, inscribed with Christian symbols and ‘characteres’. Flanking the cross at Golgotha are the plague saints Sebastian (left) and Roch (right). 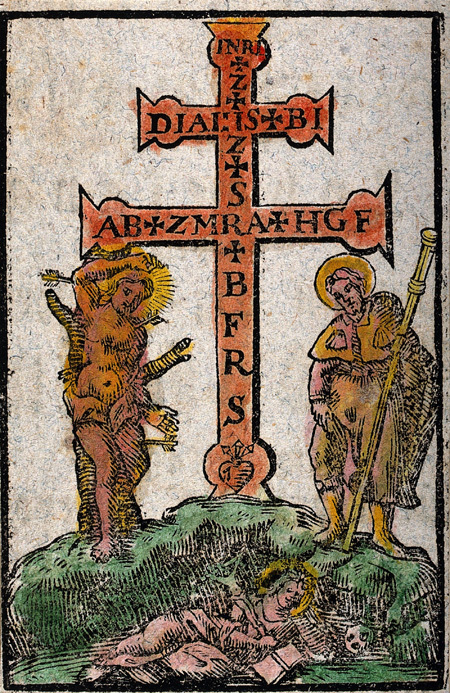 At the foot of the Patriarchal cross is a holy man in a semi-recumbent pose, similar to that in another plague amulet (shown below) in the Wellcome Library. He has been identified as Saint John of Nepomuk (1345–93), Vicar General of Prague, who was martyred when Wenceslaus IV of Bohemia had him tortured and thrown from the Charles Bridge to a watery death for refusing to divulge the queen’s confessional secrets. In his right hand, the holy man holds a crucifix, one of this saint’s usual attributes. But he lacks other attributes. His halo is similar to those of the two plague saints, rather than a halo of five stars, and he is not wearing a biretta (a square cap) or carrying a palm frond. In front of him is an open book (lying face down), perhaps depicting his confessional manual, and to the right is Adam’s skull. Despite the missing attributes, the holy man is indeed almost certainly Saint John of Nepomuk, who was initially venerated as a local patron saint for bridges, good confession, and protection against floods. But by the mid-17th century, the Church came to promote his intercession for miraculous protection and healing. 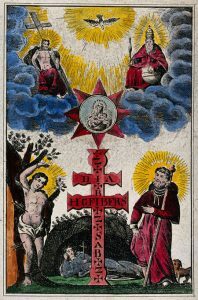 Printed amulet depicting a plague cross surrounded by Saint Sebastian, Saint Roch and Saint John of Nepomuk; above, the appearance of the Trinity. Coloured etching. Iconographic no. 11164i. Wellcome Images V0033363. The Jesuit historian and hagiographer Bohuslav Balbín (1621–88) emphasised Saint John of Nepomuk’s miracles in his life of the saint (1670). Balbín venerated him as a miracle worker against plague, war, famine and other assaults on body and soul. Many miracles involved his tomb in Prague’s Saint Vitus Cathedral. The tomb was renovated in 1679 when plague ravaged Vienna, before spreading across central Europe to Prague and other places. The Wellcome Library’s woodcut amulet may date from this devastating time or not long thereafter. Saint John of Nepomuk’s status as one of the main plague saints, along with Saint Sebastian and Saint Roch, continued to grow during the decades before his beatification (1721) and canonisation (1729). He was included in plague columns and other religious monuments in central Europe, and even came to be venerated in Spain and the New World. Medieval liturgical formulas could be abbreviated by giving only the initial letter of each word. For example, P.S.I.S.S.S. could stand for ‘Pater Sanctus, Iesus Sanctus, Spiritus Sanctus’. This simple scheme had been used in textual amulets since the 13th century, though ‘characteres’ could also include arcane symbols and magical script without verbal equivalents. Unfortunately, without a word-by-word explanation, it can be difficult to make sense of these inscriptions. Yet at the time this plague amulet was in use, clerics would have recognised the ‘characteres’ as a shorthand for the Saint Zacharias Blessing, despite a typographical error in the top crossbar (♰ D I A I : should have read ♰ D I A ♰). Bernhard Sannig (1638–1704), a Franciscan theologian active in Prague, explained the text as a remedy against the plague in his ‘Rituale ecclesiasticum’ (1698), and Gelasius de Cilia (1654–1721), an Augustinian canon from Regensburg, gave an almost verbatim version in ‘Locupletissimus Thesaurus’ (1709). Both propagated the legend that Saint Zacharias (d. 116 AD), bishop of Jerusalem, had collected this set of prayers against the plague, which were later written down on parchment as ‘characteres’, preserved in a Spanish monastery (Fraytes or Frailes), and recommended in 1546 at the Council of Trent for their efficacy. Gelasius de Cilia noted that the text was inscribed on religious medallions and metal crosses. 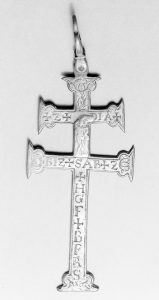 Physical evidence for such objects survives in plague crosses produced c. 1650–1760 in bronze or other metals, inscribed with the Saint Zacharias Blessing. Some of these, such as the cross shown below, have the Saint Benedict Blessing in ‘characteres’ on the verso. 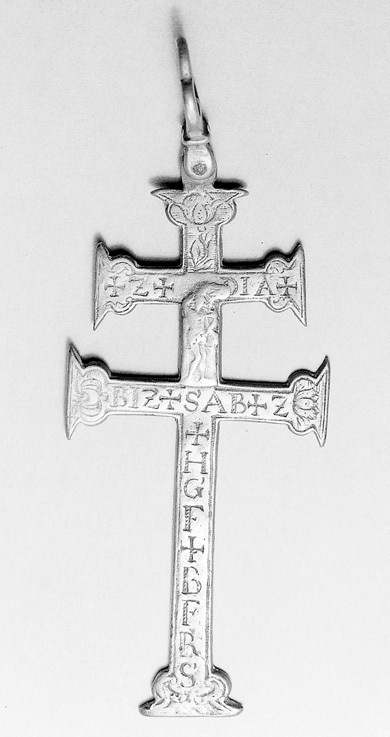 Metal plague cross, with the Saint Zacharius Blessing on one side, and the Saint Benedict Blessing on the other side. Wellcome Images M0016846. The Latin crosses in the Saint Zacharias Blessing did not serve as punctuation, nor as prompts to supplicants to cross themselves, as one encounters in many textual amulets. Instead, they stood for specific invocations of divine protection from the plague, each beginning with the word ‘crux’ (cross). The Christian numerology of seven crosses also enhanced efficacy. Each majuscule letter stood for a bit of amuletic text or scripture, mostly asking God to drive away the plague and protect the supplicant and other Christian faithful from it. For example, ‘D’ stood for ‘Deus, Deus meus expelle pestem a me, et a loco isto, et libera me’ (God, my God drive the plague from me, and from this place, and liberate me). Most amulet users would not have hesitated to use plague amulets and crosses even if they did not know what each majuscule letter signified. If anything, the mystery of ‘characteres’ served to enhance amulets’ perceived magical efficacy. Christians used plague amulets in the expectation of receiving divine protection from a dreaded disease, whose bacterial origins and medical treatment would not be known for centuries. A. A. Barb, ‘St Zacharias the prophet and martyr: a story in charms and incantations’, Journal of the Warburg and Courtauld Institutes, 11 (1948), 35–67. Ellen Ettlinger, ‘The Hildburgh collection of Austrian and Bavarian amulets in the Wellcome Historical Medical Museum’, Folklore, 76 (1965), 104–17 (especially p. 108). Paul Heitz and W. L. Schreiber, Pestblätter des XV Jahrhunderts (Strassburg: Heitz, 1918). 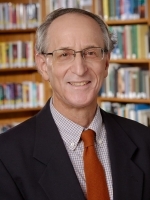 Don C. Skemer, Binding words: textual amulets in the Middle Ages (University Park, PA: Pennsylvania State University Press, 2006), pp. 165–69, 222–33. This entry was posted in Art History, Early Modern, History, Medieval, Middle Ages. Bookmark the permalink.